How much have you eaten? Thanksgiving feast is one of the most important events in every family's year, maybe just behind only Christmas. But it certainly is the biggest day for eating in the US, according to The Augusta Chronicle. Students return home from college; your relatives travel to hometowns from where they work right now. Your mum channels her inner Monica Bing to clean the whole house and cook that tasty turkey that you get to eat only this time of the year. Not only on Thanksgiving Day. That's what leftovers are for, after all. The whole family gathers in one place to be thankful for what they achieved last year. And then they get to eat those cheeseballs, crackers, chips, dips, cornbreads, stuffings, gravy, casserole, beans, cranberry sauce, salads, pies and, above all, the emperor of all Thanksgiving dishes: the turkey. That's a lot of delicious, but fat and filling food. But… have you ever wondered how many calories in Thanksgiving dinner you'll find and eat? To create our Thanksgiving Calories Calculator, we used this table from the Calorie Control Council website. It shows the average calorie intake on Thanksgiving and calories and fat data for all the dishes. 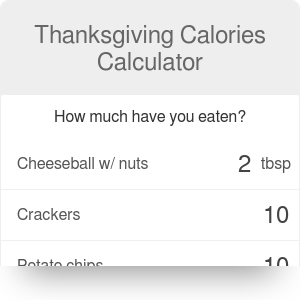 Click on the advanced mode button and you'll get all the essential nutrition data of every Thanksgiving dish. If you prefer grams, not cups unit, go to our grams to cups converter (but remember that you need to know the approximate density of the product). It turns out that on average, people eat 3150 calories during Thanksgiving dinner. That’s a lot, for many it’s much more what they need every day. And remember that a lot of people treat Thanksgiving dinner as a kind of a competition of who eats the most turkey. Some want to have a low-calorie Thanksgiving dinner and at the same time get a taste of everything that’s on the table. Everything more and they end up popping antacid pills. Regardless of whether you belong in the former or the latter group, all those Thanksgiving food calories result in something. Either they end up being used in an activity or they end up around the waist. People know that some kind of activity is a must on Thanksgiving. Families go for a long walk to the park or woods; some decide to have a little bit of more exercise and revive old rivalries with a friendly yet fierce game of Turkey Bowl. Throwing, catching and (especially) running can really make you sweat. We created this calculator to help you find out what you have to do to burn all those Thanksgiving food calories that you’ve eaten during dinner. You just type what you’ve eaten and what you want to do, and the calculator will tell you how long you’ll have to exercise to get that gravy out of your system. Keep in mind that more intense activities burn calories faster, so there's a trade-off there. Spoiler alert: a typical dinner will give you enough energy for 5 hours of football. Imagine how many touchdowns you’ll get. Or you can try Black Friday shopping for 17 hours. Unfortunately, it will be your bank account that ends up in the red zone. Thanksgiving Calories Calculator can be embedded on your website to enrich the content you wrote and make it easier for your visitors to understand your message.